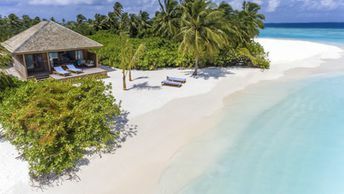 This beach ranks #3 of the "Best beaches in Lhaviyani atoll"
Hurawalhi Island Resort is a five-star property with rooms' rates starting from US$400 per night (adults only, opened in 2016). However, it makes sense to pay more for all-inclusive meal package, as a la carte menu is very expensive. It is worth to note the underwater restaurant called 5.8 - being the largest one in the World, as the hotel says. Fly to Maldives international airport (MLE). Next take a seaplane to the island of Hurawalhi. The cost of the round transfer is US$460 per person, the flight time is 40 minutes per way. The best time for a holiday on the beaches of Hurawalhi island is a dry season from January to April.